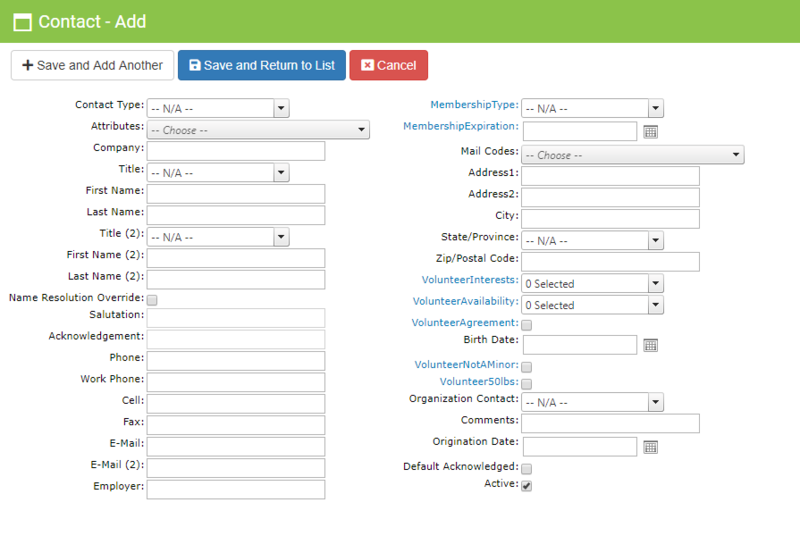 The Contact Tab is the main source of your donor information. All the basic fields of Name, Address, Phones, Email, and so much more. Contact Type: Broad types: Individual, Business, Foundation, etc. Company names will print on the reports and contribution statement, because they are the donor; not to be confused with the Employer of an individual donor. Employer: For an individual donor, this is where they Work. For example, John Smith is the donor but he works at First United Bank. Handy to know if you’re calling him during the day. MailCode: Different mailing options such as Do not solicit, No newsletter, etc. 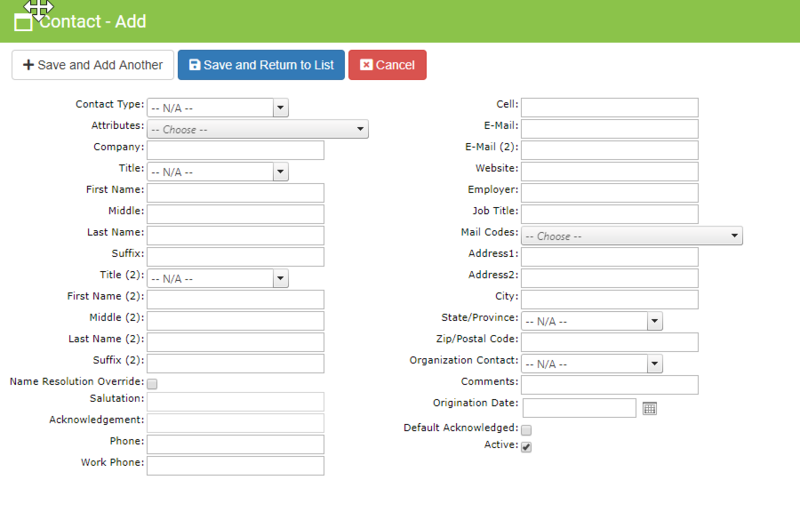 Address Fields: List the main address on the Contact tab. Address lines 1 & 2 are for the ONE address. *Remember there is an entire, unlimited Notes Tab where you can detail much more than the quick comments field on this screen. *If your comments or Notes are becoming standard with something like Kids names or communication details, consider adding a User-Defined field to this page. Organization Contact: The Solicitor or Key-staff member in charge of the donor. This is a drop-down of names populated under Community > Organization Contact. *An email is built in to DonorSnap (if you choose to enable it). When the donor makes a donation, the Organization Contact will be emailed as notification. Default Acknowledged: Check this Box if you do not want to send Thank you Letters to this donor. *Means that all future donations will be “acknowledged” by DonorSnap, hence their donation will not be added to the queue of acknowledgements to send. Active: Un-check this box when a donor becomes “Inactive”, however you define that. Could be that they are deceased or have asked to be removed from your mailing list, or that they have not donated in a few years. Here is a Contact Tab that has been customized. Fields have been removed, added User Defined fields appear in Blue. Add as many fields as you want! Technically the limit is 210 fields (and no one has ever come close). Remove fields you do not need, change the order of the fields on the page. Also, DonorSnap comes installed with a number of fields that are not visible to new users: a Deceased checkbox, Birthdate, Facebook, Twitter, Fax, etc.